Human blood was first classified into 4 well-known types in the first decade of the 1900s by Karl Landsteiner, an Austrian physician. It’s no secret that it’s important to know one’s blood type for emergency situations, as a blood match is crucial for safe transfusions. It turns out, however, that blood characteristics can also influence our health, and, as some people believe, our fortune and personality as well. 1. How are blood types determined? Blood types, or blood groups, are classified according to the presence or absence of certain antigens that can trigger an immune response when they are foreign to the body. These antigens can make the immune system of the patient attack the transfused blood. This is why it is so important to know your blood type and to be aware of the safe matches for blood transfusions. 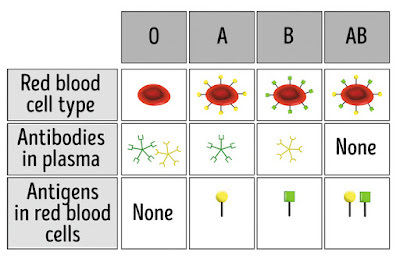 There are 4 main blood types determined by the presence or absence of A and B antigens in the red cells’ surface and A and B antibodies in the plasma. In addition to the A and B antigens, there is a protein called Rh factor which can be either present or absent. Altogether, this makes up 8 blood types: A+, A-, B+, B-, O+, O-, AB+ and AB-. Type O blood has neither A nor B antigens in the red blood cells but has both A and B antibodies in the plasma. Type O+ is the most common blood type which accounts for 37% — 53% of people in different ethnic and racial groups. 3. People with type O blood are universal donors. People with type O+ blood can donate their blood to all 4 groups, but only to people with the RH positive subgroup (O+, A+, B+, AB+). Red cells of O- type can be transfused to all 8 subgroups, which makes it a universal blood type that is always needed for emergency transfusions. Type O- blood is transfused in emergency cases when it is important to save the life of a patient before the crossmatch test is completed. What’s more, is type O- blood is the safest for newborn babies whose immune systems are under-developed. 4. Type O blood individuals can receive type O blood only. People with type O+ blood can receive blood from people with both O+ and O- types, while those who have type O- blood can only receive the same O- type blood. In emergency cases when type O- blood is in short supply, it can be substituted with type O+ blood. According to scientists, there are ways in which blood biochemistry determines our health. Even though the influence of blood types on our health is still under research, there are certain theories on health risks and benefits for people with different blood types. It is considered, in particular, that people with O blood type can be more susceptible to some bacterial and viral infections than other blood groups, including severe ones like plague, cholera, mumps, and tuberculosis. Some studies also show that blood type O individuals have a 35% higher incidence of duodenal ulcers compared to people with A, B, and AB blood types. 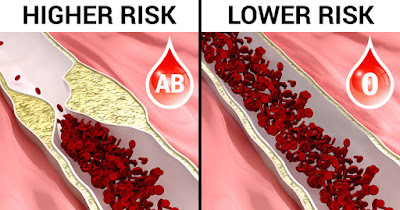 People with type O blood have the lowest risk of developing coronary heart disease compared to people with A, B, and AB blood types. Studies show that non-O blood type individuals have a 25% higher risk of developing pancreatic cancer than people with O blood type. What is more, is people with blood type O have a lower risk of developing circulatory diseases and cognitive disorders. However, keeping a healthy lifestyle and managing health risk factors is crucial for avoiding diseases, no matter what blood type you have. You might have heard of the so-called “blood type diets” that claim that eating certain products matching your blood type will help you stay fit and healthy. Despite their great popularity, blood type diets lack scientific evidence and are not universally acknowledged. Nutritionists suggest that it’s better to follow a personalized diet considering your individual health state rather than a diet related to your blood type. The influence of blood type on people’s traits of character is rather debatable, but this theory is very popular in some countries, in particular, Japan. TV shows, newspapers and magazines often publish blood type horoscopes and romantic compatibility charts, while Japanese manga, anime, and video games mention characters’ blood types. The Japanese believe that people with O blood type are generous, passionate, sociable and financially successful and that the best romantic match is found between type O and type A people.